The New York Times is reporting today that Facebook has changed your privacy settings again. As usual, Facebook has made this move without consulting users and, more importantly, without users' consent. According to the report, from Sophos, Facebook recently began changing its users’ privacy settings to automatically turn on a facial recognition feature that detects a user’s face in an image. 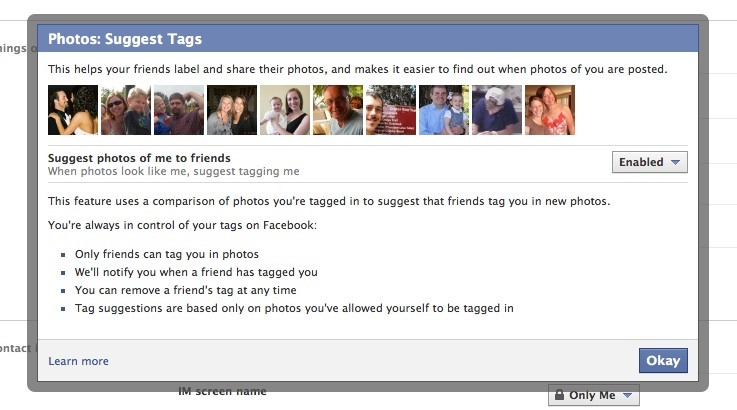 Once the person’s face is detected, the Web site then encourages Facebook friends to tag them. Facebook introduced this feature last year for its North American users; it is now rolling it out globally. You can change the privacy settings relating to the facial recognition feature, but it is a little confusing. If you want to disable the feature, go your account privacy settings and click “customize settings” at the bottom of the page. Once in this area, scroll down to a list of options called “things others share,” and then click on the button that says “suggest photos of me to friends.” You will then be given the option to disable the facial recognition feature. As you can see in the picture below, this "feature" was enabled for me when I checked, though I never enabled it. How nice of you, Facebook, for presuming to know what level of privacy I desire. I also decided to check my other privacy settings to see which other settings Facebook decided to change without my consent. I recently joined a new network (FSU, since I am starting my PhD their this fall) as you can see. 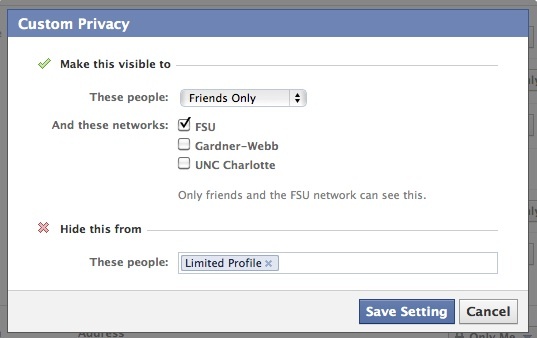 What I noticed was that even on settings I had specifically edited to only be visible to certain friends and not visible to those on my Limited Profile, Facebook decided that everyone in the FSU network should be privy to this information as well. Again, this was done completely without my consent. In the day of people sharing more and more, plenty of people are concerned with how much of their information they share with others, especially with complete strangers (Aside: Newsflash, Facebook, with over 40,000 students at FSU the idea that I would want all of them to see my information, pictures, wall posts, etc. is absurd!). Sadly, it seems that we will all have to continuously check our Facebook privacy settings to see what new "features" Facebook has decided to opt us in to without our consent.